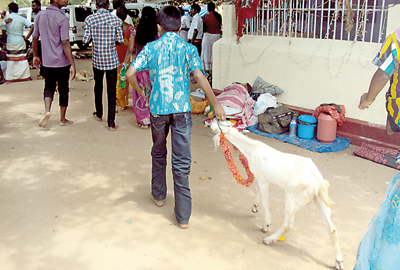 A 500-year-old ancient kovil ritual of animal sacrifice in Chilaw was put on hold after President Mahinda Rajapaksa intervened and requested that the practice be suspended till the sacred Kapilavastu relics brought from India leave the country, while a senior official of the Buddha Sasana and Religious Affairs Ministry said there are no discussions taking place right now on a possible solution. Authorities at the Sri Badrakali Amman Kovil in Munneswaram have called off the ritual, which is a part of the annual temple festival but Kurukul Sivapathasundram, attached to the temple, said that arrangements were made to recieve the animals. However he did not comment when asked whether the sacrifice will take place later this year. The issue of animal sacrifice at the Kovil continues to generate controversy year after year.Mass Media and Information Minister Keheliya Rambukwella said the Government will take up the issue only after the court case is over and declined to comment. The Court of Appeal decided to postpone till September 4 hearing fourteen petitions filed against animal sacrifice at the annual festival of the Sri Badrakali Amman Kovil. The petitions are from several organizations such as the Sri Bodhiraja Foundation, the National Sangha Conference, the Sri Lanka Animal Protection Association, the Jathika Sangha Sammelanaya and several individuals. The petitions are seeking a court order preventing the slaughter since it is in violation of the provisions of the Prevention of Cruelty to Animals Ordinance and are to be carried out in violation of the law that requires a licence under the Butchers Ordinance from the local authorities to carry out the slaughter. The respondents cited in the petition include the Inspector General of Police (IGP), OIC Chilaw Police Station, M. Kanagaratnam, Kalimuttu Shivapakyasuntheram and Mahendra Samy of the Munneswaram Sri Bhadrakali Amman Kovil and several others. Meanwhile a senior official of the Buddha Sasana and Religious Affairs Ministry told the Sunday Times this is a serious issue and as there are religious and ethnic groups involved the Government should be careful before taking any final decision on the issue even though it has been solved temporarily. Meanwhile kovil authorities claim the customs and practices are carried out for the welfare of the people and the country. However, animal activists and organisations, which are against the aged-old practice, claim that it is a commercial venture. Animal Welfare Trust member Lalani Perera claims the sacrifice has now been transformed into a thriving business where goats and chicken are bred purely for sacrifice and sold to devotees at a high price. Some of the flesh of the slaughtered animals is distributed among the public and even some law enforcement officers and the balance sold to meat stalls. 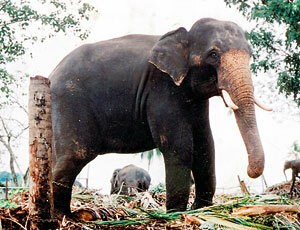 Even a petition has been filed in Court of Appeal to prevent the slaughter and another has been filed in the Chilaw courts seeking the punishment of the kovil priests for the offences they have committed by killing the animals. The All Ceylon Hindu Congress (ACHC) President V. Kailasapillai condemned animal sacrifices or any cruelty to life as an act of sin and unacceptable.“We appeal to the Kovil management and priests not to proceed with the same. “At the same time, we appeal to the politicians and non-Hindu religious groups not to interfere in this matter and make it a political issue or create religious disharmony,” he said.